My mom doesn’t like Goths. Not that she’s ever really known one. But she seemed confused and displeased when I first told her my trilogy was rooted in the conflict between the Goths and Rome. I know I have really well-informed readers here, but on the remote chance you share her confusion (or displeasure), I thought I’d clear a few things up—as I tried to do for Mom. Hopefully, confused or not, you’ll find it interesting. A Tale of Two Goths: Turns out my mom’s confusion was what led to her displeasure. I was talking about the Germanic Tribe of the Goths, and their cultural and sometimes violent clashes with the civilized world, represented at the time (during the first five or so centuries AD) by the Roman Empire. Meanwhile, my mom had conjured images of pasty-faced youths with blue lipstick and multiple body piercings, rolling out of bed at midday after a night of crazed dancing to industrial techno music to voice their opposition to the Roman Catholic Church. I wrote an article for the homepage of my website called The Origin of Epic. In it, I reveal that my interest in the Goths began early, when I read that Tolkien’s Riders of Rohan were based on the Goths. When my school history courses covered the fall of the Roman Empire, the Goths, being the first to sack the city of Rome, were always among the featured antagonists. The seemingly divergent viewpoints (cool horse-warrior good guys vs. evil horde that helps to extinguish the light of the civilized world) led to an ongoing curiosity. So when I mention the Goths, I’m thinking of Éomer son of Éomund, bearer of the sword Guthwine. 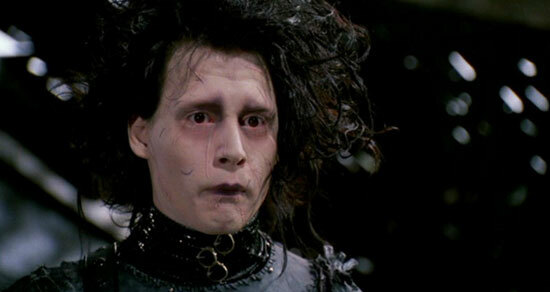 Mom, on the other hand, is thinking more along the lines of Edward, wielder of Scissorhands. Roman Disdain/Admiration: One of the challenges I faced in featuring the Goths in my story was the lack of literary sources. Although roughly the same percentage of Goths were literate as Roman citizens (around 15%), alas the Goths left few surviving writings. The writings of Romans such as Tacitus and Marcellinus demonstrate a sort of love/hate fascination with the Germanics generally and the Goths particularly. Tacitus says they “…all have fierce blue eyes, long red or yellow hair, and huge frames apt for sudden exertion.” Grave site analysis has borne him out on their size. Goth males were, on average, four inches taller than their Roman soldier counterparts. And as for the red or yellow hair, it was greatly admired back in the homeland’s cities. Blond wigs and hair dyes were all the rage in imperial Roman high society. Although Roman authors speak admiringly of the Goths’ physical beauty, battlefield fierceness and valor, and chaste marital bonds, they also speak of their impulsiveness, lack of capacity for reason, and proclivity to sloth, drink, and gambling. Hmm, that last part sounds a bit like… just about every powerful group of humans speaking of their foe. The answer, as it so often does, lies in literature—or, in this case, in a literary movement. But in order to understand the origin of Gothic literature, we’ve got to take a quick look at Gothic architecture. Gothic describes the architectural style of the middle to late medieval period. But the term was attached to the previous era’s style by the new architects of the Renaissance. They meant it as a pejorative—archaic, outmoded, severe and ungainly. It’s Alive! By most accounts, the Gothic movement in literature started with a single book: Horace Walpole’s The Castle of Otranto: A Gothic Story (1765). Contemporary readers were enthralled by the book’s suspenseful weaving of the medieval setting and the supernatural trappings of the plot. So much so that the book instantly spawned hosts of imitators. 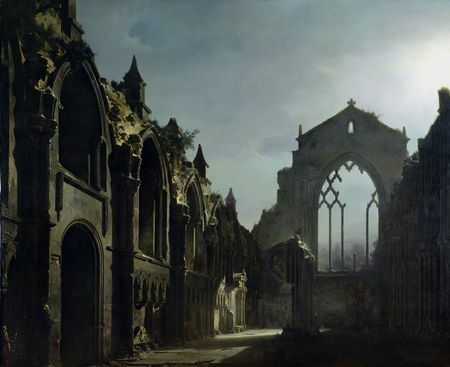 And so a thriving genre was born, and Europe’s aging and ungainly gothic castles, manor houses, and monasteries became the setting for ghosts, monsters and the undead. Flash forward a couple hundred years, and fans of the creepiness still dress to suit the macabre underpinnings Walpole established. These fans are my mom’s preconceived Goths. When Goths Were Still Cool: In 451, as the western Roman Empire slowly crumbled and at the urging of Emperor Valentinian III, a confederation led by the Visigoth king, Theodoric I, defeated Attila the Hun and his Vandal allies at Chalons, France. The Gothic kings had become central to the inner workings of empire. I mention this because, however you heard it in history class, the empire did not fall when Rome was sacked by the Goths under Alaric in 410 (also, did you know Alaric considered himself a member of the imperial military, and marched on Rome to demand his rightful status and pay for his men after fighting to defeat a Frankish usurper at the Battle of the Frigidus?). Kings of a Score of Kingdoms for a Thousand Years: In tribute for their service to a failing empire, the Visigoth kings were ceded large tracts of imperial territory in Spain, southern France, and southwestern Germany. Shortly thereafter, the Ostrogoth Kings of the east were grabbing territory on the Italian peninsula and in the Balkans. For many centuries, the Spanish nobility self-identified by laying claim to being of the blood of the Goths. Because the Goths supposedly originated in Götaland, Sweden, until 1973 that nation’s monarch’s title was King of the Swedes, the Goths and the Vends. At the Papal Council of Basel in 1434, the Spanish and Swedish delegations of cardinals clashed over the rights to sit closest to the Papal seat. It’s said the Swedes argued that since their forefathers founded all of the Visigoth and Ostrogoth kingdoms, they should sit closest to the holy seat. The Spanish delegation supposedly retorted that only the lazy and unadventurous Goths remained in Sweden while the heroic Goths conquered an empire and established their highest seat in Spain. I’m pretty sure my mom’s preconceived Goths would never vie for such a spot. Éomer of the Riddermark or Dracula of Transylvania? So what’s your first thought when you hear the word Goth? How ‘bout your mom? Do you think Goths will ever be cool again, or did I pick a (twice) doomed subject? This entry was posted in Uncategorized and tagged Eomer, Gothic literature, Goths, Roman Empire, Visigoths. Thanks for the history lesson, Vaughnagoth! (And for pretending some of your readers are well-informed…) You make Goths cool again! Wonderful! Now I’ve got a name for the MC of my next book, thanks to Dee the Well-Informed! Fab. article. It would convince my mother Did it convince yours? (Not that my mother would have needed much convincing: she made me a couple of, what she called, “chick punk” dresses, back in the day). Have you told your mother about Gormenghast and its literary success; or Harry Potter and how the moving portraits were likely influenced by Otranto? Thanks Sevigne! Your mom sounds cool. 🙂 My mom thought she was hip in the seventies when she added pant-suits to her wardrobe. She was hip. Especially if she didn’t live in London, Paris, New York, or Rome. I copy here for your mother the opening of book that starts with a story about women’s clothing. “On a steamy morning in the summer of 1960, Lois Rabinowitz, a 28-year-old secretary for an oil-company executive, unwittingly became the feature story of the day in New York City when she went down to traffic court to pay her boss’s speeding ticket. Wearing neatly pressed slacks and a blouse, Lois hitched a ride to the courthouse with her husband of two week, Irving. In traffic court, Magistrate Edward D. Caiazzo was presiding. I suppose for a midwestern woman in a medium size city, she was pretty hip. I was the youngest, and she went to work when I was about twelve–a big deal then, as I recall. Kids would say, “Your mom works? Who makes dinner?” The answer: we all learned to cook, and I still enjoy it to this day. So I suppose I owe her a debt of gratitude for that, at least. Thanks for sharing that snippet, Sevigne! Love this! (Still chuckling over the Edward, wielder bit. ) And it reminds me of how much I absolutely adored Gothic architecture. The cathedrals were so brilliant — and, true to my nature, every mathematical aspect had a spiritual as well as architectural purpose, every decoration generally had more than one meaning. I used to get so pissed at Renaissance art history professors who would downplay Gothic as inferior. Grrrrrr! Misunderstood brilliance! Great post Vaughn. I admit I first think of youth dressed in black with multiple piercings, black nail polish and lips! And, I really enjoyed learning the history of Goths. “…huge frames apt for sudden exertion.” Indeed! Thanks, Brin! 🙂 It should come as no surprise that my character Brin Bright Eyes (the daughter of a Goth chieftain and a female warrior known as a Skolani Blade-Wielder) is tall and lithe, and has red-gold hair and fierce blue eyes. 😉 Glad you enjoyed the post! I have a confession- once upon a time, I was one of those “Goths” your mother, and mine, didn’t understand. One of my sisters still has a photo of me in heavy eyeliner and a dog collar for blackmail purposes. Some of it has carried over as I’ve grown. I appreciate reading and telling a good Gothic story, love the architecture, and the music always finds its way into my writing playlists. I love that you delved into the history of Goths/Gothic, and its layers. Makes me yen to go back to school and take more art and music appreciation classes. History’s influence on modern pop culture amazes me. Reciprocal confession: I spent a few too many nights among Goths with the likes of The Cure, The Sisters of Mercy, and Shriekback droning in my ears. And the blackmail pics of me feature a mullet. Not Billie Ray style, but definitely party-tail in the back and punk up top. I still have the Goth type music on my playlists, too. Attila first sparked my first interest in that world. Before this, I naively saw the Huns as brutes with childlike reasoning, bent on senseless rampages. (My RC grandmother had something to do with that. lol!) I was shocked to learn he was educated and had actually spent time in Rome among the nobles. It makes sense. Warriors with child-like reasoning cannot overcome the odds he did by chance. He had to use his brains along with his brawn. When I hear the word Goths, I think of Spartans. Minimalistic, great survival instincts, imposing warriors, raw strength due to natural (and human) selection–all the things borne of hard living and supreme determination to exist despite the challenges. All great story fodder. Oh, I’m glad you have a Goth-styled group in your world, too, D! We’ll set the new trend together! I have the coolest book on Attila. *Runs downstairs to get book* Got it! It’s called The End of Empire, by Christopher Kelly. It follows a Roman emisary’s journey to Attila’s camp in present day Hungary, and how he was treated, etc. Fascinating stuff! My books 2 & 3 feature Huns, but I’m noodling over a plot thread that would feature them even more prominently moving forward. Regarding the similarities to the Spartans, they did have a warrior culture. They were farmers and herdsmen and fullers, but they were warriors first and foremost. I think it was the nature of being a migratory people. Everywhere they went, they were the invaders–the foe. They had to be badass to carve a home in each new land. Aw, my little homeless group is too small for trendsetting but I’ll happily enjoy the trail you will blaze. Such a fascinating post, Vaughn! I really enjoyed it, and hoped it helped change your mother’s mind. Have you read How The Irish Saved Civilization? You might enjoy it. Not strictly about Goths, but does talk in the beginning about the marauding hordes that slowly chipped away at the Roman Empire. It was very well done. It’s been a few years, but I did read How The Irish Saved Civilization, and really enjoyed it. I thought of it often when I was in Ireland. I’m sure all of that went into the hopper when I brewed up my world, too. Might be worth a reread. Great post. As for me, I like it all. Early Goth (as for drinking and assorted other vices you Roman finger-pointers, may I just say one word? Caligula? Hello? ), Middle Goth (not a religious person but being in a Gothic cathedral it’s hard not to have a religious experience), and Late Goth (yes, I was also at the Shriekback, Ministry, Cure, Sisters of Mercy, Echo & The Bunnymen, etc concerts, multiply-pierced and with a platinum blonde mohawk, just posted a pic on my blog in fact). I also like Gothic/neo-Gothic literature. And I loved Pillars of the Earth, almost as much as Sarum (Rutherford), which is similar and if you haven’t read, it you might like it also. Hey Rhiann, thanks for stopping by! Lol on Caligula. “Hello, pot? This is kettle,” right? No kidding on the religious experience of the cathedrals. The builders knew what they were doing, in terms of inspiring awe and reverence. And I have read Sarum, back when it came out. As with Liz’s suggestion above, I think it’s worth a reread. I’ll see if I can dig it up around here. Thanks for the reminder. One theme of the books, not surprisingly, is about how we treat outsiders. The stories we cultivate about them, and how marginalizing people harms not only them, but society. I’ve known several people who’ve embraced and taken the Goth persona to various levels. I hate to generalize, but I have to say that a few things seemed to connect them all. They’re all intelligent, sensitive, and artistic individuals. And, as you allude to, they not only all consider themselves outsiders, but all seem to relish the role of the outsider. Perhaps that is a part of the projected persona–to reject the idea that they need or want inclusion, other than by likeminded souls (fellow outcasts). Based on your comment, I’m compelled to read Larsson for the first time (Mo read them and her reaction made me doubt I’d enjoy them). Part of my reasoning for renaming everything–groups, cities, empires–was to keep people’s preconceptions of Goths, Romans, Greeks, Persians, at bay. I wanted to put story at the forefront, which is how I ended up with a historical fantasy with no magic or intelligent non-humans. I think Gaiman sort of has the market cornered on Gothic post-modern fables. 😉 But it would be fun to view it from a new perspective. I definitely want to do something totally different as an in-betweener. Thanks, Jan! I don’t know your reading tastes enough to advise you on whether you’d enjoy Larsson. They’re largely mysteries and police procedurals, so there are big chunks that are slower and dryer than I anticipated. The thriller elements aren’t hugely unusual, either. What I enjoyed was the setting, the culture, and the characterization, with very European and practical sensibilities about male-female relationships. IMHO, they were what made the books special. Lisbeth Salander was a great mixture of brains, ability, and vulnerability. I haven’t seen the NA version of the first movie, but the European movies didn’t come close to the books in portraying the inner conflicts and relationship dynamics. Anything that you’re this passionate about will be reflected in your writing, and readers will love it! What a wealth of information. Oh, the Dark Knight is very Gothic, and the root word of Gotham is Goth, right? It’s definitely a name that conjurs a dark urban image, full of wild (barbaric, even?) influences. I hope you’re right, Nicole, and that my passion for history will be reflected, and enjoyed, by my readers. 🙂 Thanks the well-wishes and for reading and commenting, my friend! I enjoyed your history lesson Vaughn. (And I profess to being a lover of all things Goth, including Poe, Edward Sissorhands (great film) and The Smiths…) As for the Goths who sacked Rome–the way you described ’em I saw those dudes as kinda having a Viking feel –or was it just me gettin’ that vibe–the sacking of Rome to a soundtrack of the Immigrant Song? I love your Goth list–particularly The Smiths. Your sense that the Goths were Viking-like is spot on. Nobody knows for sure where the Goths originated, but most experts are fairly sure they came from present day Sweden and migrated across the Baltic Sea to present day Poland fleeing a mini-ice-age. They migrated south to the Black Sea region over a period of several hundred years. So both the Vikings and the Goths are Norsemen. I LOVE the idea of sacking Rome to the Immigrant Song! In fact, I’m adding that to my battle-scene writing playlist. 🙂 Thanks, Bernadette–glad you enjoyed my little history lesson! I may be wrong but I had heard that Rohan was based on the old Norse world not Goth. The Norse (Norway) had a mythical legend that Tolkein admired. I am not aware of any Goth myths that have survived. Both groups are blond and blue-eyed. Thanks for reading and commenting, Jeanne. Certainly there can be no doubt Tolkien drew heavily on Norse culture and myth. Some say he was most influenced by Beowulf (Anglo-Saxon, but set in Geatland, in Sweden) and other Old Norse poetic eddas like Völuspá. And many think that Rohan, since the language draws so heavily on Anglo-Saxon, is Tolkien’s fantasy of his ancestors with a horse-warrior culture they did not actually have (wishful historical revision). For me, the idea that he based them on the Goths began with my sixth-grade teacher, who was responsible for my reading LoTR. He speculated that the Rohirimm, since they were Northmen–herdsmen who had mirgrated south to a windswept plain (same as the Eurasian Steppe to which the Goths migrated), and that they were former foes but now allied with a once-great empire of men (Gondor), same as the Goths fought but then allied themselves with the crumbling Roman Empire, were closer to the Goths than the Anglo-Saxons. Just my (and his) theory. Either way, or even if both are incorrect, you’re right that Tolkien based much on the Old Norse. Thanks again! Great history stories, Vaughn. Thanks! The kids and I studied the fall of Rome last year. I like hearing the other, non-history-book version. I’m always interested in the flip side. And I agree with Jan that you should write a Gothic fable!